Purpose: Business Analytics drives business decisions and the better the date the better the analytical insight. 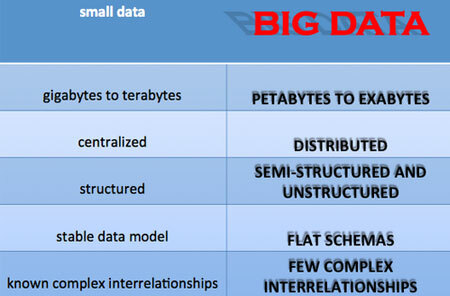 Small data is centrally controlled data. Big data proposes a new way to structure and organisation data in response to the flood of data now coming from a wide variety of sources such as the internet, mobile devices and other networked devices. Big Data is the new definitive source of competitive advantage across all industries. Enterprises and technology vendors that dismiss Big Data as a passing fad do so at their peril and, in our opinion, will soon find themselves struggling to keep up with more foreword-thinking rivals. For those organizations that understand and embrace the new reality of Big Data, the possibilities for new innovation, improved agility, and increased profitability are nearly endless.